NO BLOG :) I know it's been a while...but I'm still here, promise! 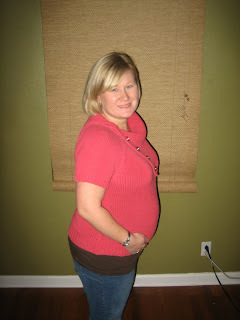 I am officially 7 months pregnant, and have just entered into my 3rd trimester! Wow...where has the time gone? Tomorrow we go to the dr. for our glucose test! Hopefully and prayerfully I'll pass with flying colors...if not, we'll cross that bridge when it comes! I know Palmer and I are in God's hands, none of this would even be possible without HIM! Also, Wednesday, we go back to the high-risk dr. for another echocardiogram of Palmer's heart! I'm hoping to, once again, get the all clear! 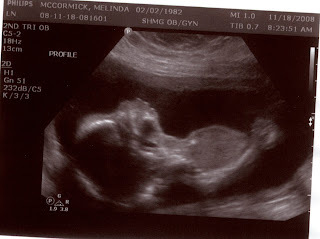 We have been talking about doing the 3-D ultrasound soon....if any of you have any thoughts on 3-D, I'll gladly listen! 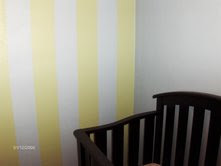 Here is a pic of Palmer's walls.....some have asked to see the stripes. The colors in this pics are AWFUL! I guess it's the lighting in the room?! Hopefully once his room is all finished I can open the windows and get lots of light to see the "true" color! BTW...this is part of his crib in the room. We are still waiting on the other furniture, but my parents were sweet to buy this for Palmer (and us) for Christmas! We couldn't wait to put it together to see how precious it was! 1. I am so in love with my husband, and don't know how I got so lucky! 2. I love my family and don't know where I'd be without them. 3. My parents are my best friends and I respect them more than they know! 4. I have been involved in two accidents (not my fault) in less than 6 months. 5. I sleep with my air conditioning on 68 every night, and the fan must be on high! 6. My sister is my opposite and I may not always understand her choices, but I do love her and don't know what I'd do without her! 7. I am not a trusting person at all. 8. I am in awe of My God! 9. I feel my life calling is to be a mother. 10. I always had a strange fear I would never get pregnant. 11. I am 22 weeks pregnant. 12. I would love to go back to school to become a nurse. 14. I met my husband on the internet, and went on a blind date with him! 15. I have a serious shopping problem! 16. I love to get dressed up. 17. I am terrified of how much weight I'm going to gain while I'm pregnant. 18. I love to drink wine. 19. I used to love to go out, but now I would choose a night in. 20. I am always early, for everything. 21. I love my puppy. 22. I have extreme anxiety problems, and have no idea who I get it from. 23. My dad is a police officer. 24. My mom is a school teacher. 25. I can't wait to see my cousin Courtney again, one day. 26. I miss old friends sometimes. 27. I really love my close girlfriends...they are amazing women! 28. I never leave home without my cell phone. 29. I love my job! 30. I can not believe how much daycare costs! 31. I am in love with Palmer Bain McCormick! 32. I do not like needy people. 33. I do not understand how people can leave home without deodarant. 34. I wish I could be a stay at home mom after Palmer is born. 35. I can't imagine not living near the beach. 36. I cry all the time. 37. I like to be in control and am very stubborn. 38. I have a really hard time asking for help. 39. I do not like that my hair is getting darker as I get older. 40. I wish I was a skinny person. 41. I love Italian food! 42. I loved our neighborhood growing up. 43. I have no patience. 44. I work at a bank, and agree with Brandy. The avg person is not very smart when it comes to their money. Do NOT blame the bank when your account is in the negative. 45. I am terrified of giving birth! 46. I want my epidural as soon I as I arrive at the hospital. 48. I love getting flowers! 49. It took my 6 years to graduate college. 50. I got two degrees and a minor. 51. I use to go out 5 nights a week, before I met my husband. 52. I think people that are overly sure about themselves are trying to make up for something they lack. 53. I hope my child turns out more like his daddy. 54. I love family get together's. 55. I hope I'm a good mother to Palmer, like my mom was to me! 56. I wish I would have studied harder and appreciated school more. 57. I always try to put myself in the other person's shoes. 58. I found Palmer's name online, and fell in love with it! 59. Palmer's middle name, is my dad's middle name. 61. I love going to get my hair done, even if it doesn't always turn out like I'd hoped! 62. I love buying new shoes and purses. 63. I don't sleep much. 64. I love our house, but am ready to be finished re-doing it. 65. I love coming from a big extended family. 66. I am very critical of people, and I can't stand it. 67. I am a very very nosey person!!! 69. I believe 100% in the union of marriage. 70. I can't imagine living far away from my parents. 71. I have days when all I want to do it sit around and do nothing at all. 72. I love to travel. 74. I think muscular women are gross. 75. I hope to have a daughter some day. 77. I would love to travel to London to see Jennifer and Colin. 78. I love to read true stories. 79. I love to read other people's blogs...even if I don't know them! 80. I wish my great-grandmother was still alive, she was such a strong Christian woman! 81. My parents have been married for 32.5 years! WOW! 82. I am very proud of my education! I'm soo glad I stuck with it! 84. I have a really bad habit of dropping my cell phone. I drop it at least once a day! 85. I love food. When it's breakfast, I'm already thinking about lunch. I have been this way as long as I can remember, long before I was prego! 86. I love my bed. 87. I am an 80's child! 88. I am not scared of confrontation. 89. I am not afraid to stand up for what I believe in. 90. I am extremely hard on myself. 93. I love buying furniture. 94. I love antique jewelry. I really love the stories that go with the jewelry. 95. I wish I had a hobby. 97. I love getting my toes done! 98. I love to wear blue jeans. 99. I totally believe in plastic surgery! 100. It has taken me about 6 hours to fill this out. It was REALLY hard to come up with 100 things about ME! Well, Today was the big day! I'm so happy to be able to share the news that all is well with little Palmer. 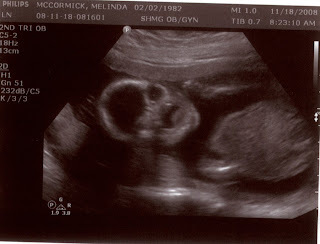 Dr. Thorp said he looks perfect, and as of now, there is nothing to be worried about! Oh, I feel so blessed! We will go back to see Dr. Thorp in 7 weeks, to be sure everything is still normal and great! I have to say, on a side note, Mac has been a real trooper this past week (and the whole pregnancy) to put up with my stressed out, emotional self :) Pregnancy sure is fun! Thanks to everyone for their continued prayers for my pregnancy, little Palmer, and Mac and I! Now, on to Thanksgiving. On a few other blogs I read (stalk), people have listed things they are Thankful for....I've decided to be a copy-cat and do the same! 5. This amazing little boy in my belly! I love him already, and have yet to officially meet him. I hope everyone of you has a wonderful day tomorrow, with family and friends. Jenn, I know it won't be the same without your family, but think how much fun it'll be in 3 weeks when you're HERE!! :) Also, I MUST give a special Yiipeeee to my favorite Elizabeth Claire.....CONGRATS to you and Adam!! I'm soo excited and happy for the both of you! Can't wait to see ya'll! Today is a new day! I slept from 7:30 last night until 6:15 this morning and I'm feeling good. I'm still stressed out, but definitely feeling more upbeat than yesterday! I know God is good, and there are many prayers going out for little Palmer! Thanks to everyone for your sweet words and for your prayers! Everyone always wants to see pics....Enjoy! Palmer with his mouth wide open.....I guess he already takes after his momma ;) It sure was hard to get a good profile picture today.....He just didn't want to sit still!